Interesting and unusual coins are no longer just for collector’s to acquire and hide away in safety deposit boxes or safes. Coins can be used to create a variety of stylish and distinctive items people can use everyday. Items made as amazingly beautiful coin jewelry are designed in styles appropriate for both men and women to wear. The coin is usually placed in a position where it becomes the focal point of the piece. In necklaces with coin pendants the pendant will have either silver or gold use to create the backing with the coin set inside the metal. Pendant jewelry for women is usually designed in more decorative or ornate styles than pendant jewelry for men. The decorative portion of the pendant is usually found around the outer edge which can be enhanced with decorative stones such as turquoise. Alternative ornate pieces use an inlay of stone on the metal used for the backing, with the coin set into the stone in a position which makes the piece artistic and original in design. Stylish bracelets for women can also be created using various coins to accentuate the pieces. Coins can be hung from a chain link bracelet in a similar fashion to charms, or used as a single pendant. In addition to the jewelry designed using various coins, there are other items which can be made to incorporate these interesting objects into them. 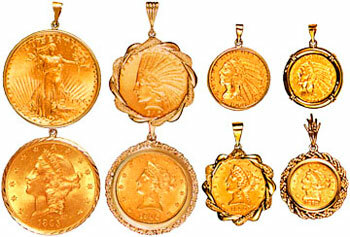 Coins can be used to create distinctive keychains for men and women of all ages and occupations. A distinctive design for a man places an Indian head penny into a base designed to replicate the appearance of an arrowhead. Other key ring designs for men include styles created to replicate the look of automotive logos. These styles usually have the coin set inside a circular base with a decorative colored background. The coin chains for women designed as key rings can come in styles more appealing to their feminine sides. An elegant mercury dime can be set inside a gold heart designed to replicate the look of a heart locket. The heart shape can also be used as a cut out for a larger piece of metal such as silver, with the coin set on a small section inside the cut out. The distinctive, elegant and original styles of these key rings make them perfect items for gift giving or to use as keepsakes for special events.